Climate change concerns: Ocean level. Two articles were published in the Proceedings of the National Academy of Sciences. "I think we can definitely be confident that sea-level rise is going to continue to accelerate if there’s further warming, which inevitably there will be." Researchers at the University of Washington and the Nature Conservancy have computed the future effects of global warming and the resultant rise in sea levels on existing species of mammals, birds and amphibian species. They estimate that almost 3,000 species will find the climate in areas where they are currently located to be too hot and inhospitable. Animals will "have to head for the poles." 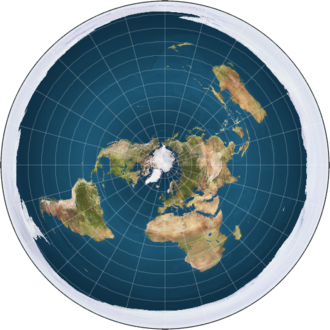 In recent years, the Internet has been inundated by articles and videos by individuals promoting the concept of a flat earth. In the VERY unlikely event that their beliefs are accurate, then if the ice there were to melt, it could mean a disaster for the Earth. That is because most of the flat earth enthusiasts claim that the Antarctic is not a continent that has roughly the area of the U.S. and Mexico combined. Rather it is a ring of ice of unknown width around the edge of a flat, circular Earth, as shown below. A common concept of a "flat earth"
If the Antarctic should should follow Greenland's trend and melt -- at even one location -- then the water from all the oceans of the Earth would drain off the edge of the world and be lost. The impact of this event is difficult to comprehend, but would be massive. It is a pity that the Earth is not structured as the Flat Earther's belief. If it were, then we might be able to excavate a channel through the ice wall at its narrowest spot and use it to drain off excessive water in a controlled manner. That could restore ocean levels to their earlier value, and reduce costal flooding around the world. The term "Third Pole" refers to a region that is south of China and north of India. It contains the third largest area of frozen water on the planet and covers about 100,000 square kilometers. Ten of the largest rivers in Asia start there. "It is estimated that the water that flows from the Third Pole supports 120 million people directly through irrigation systems, and a total of 1.3 billion indirectly through river basins in China, India, Nepal, Pakistan, Bangladesh and Afghanistan. That’s nearly one fifth of the world’s population. More information from later in 2016 is in the next essay.